Team RWBY (from Left to Right) Ruby, Weiss, Blake, Yang. The web series RWBY–produced by Rooster Teeth Animation in Austin, TX–has become my new favorite feminist cartoon. 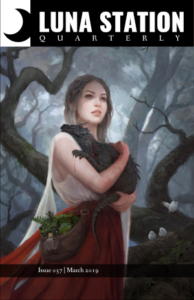 Vaguely based on fairy tales, the show takes place in the world of Remnant where young people aspire to be Huntresses and Huntsmen to protect their world from the creatures of Grimm. The series beings when Ruby Rose–an energetic, optimistic weapons enthusiast–skips a few grades and gets accepted to Beacon Academy, one of the premier schools for Huntresses. 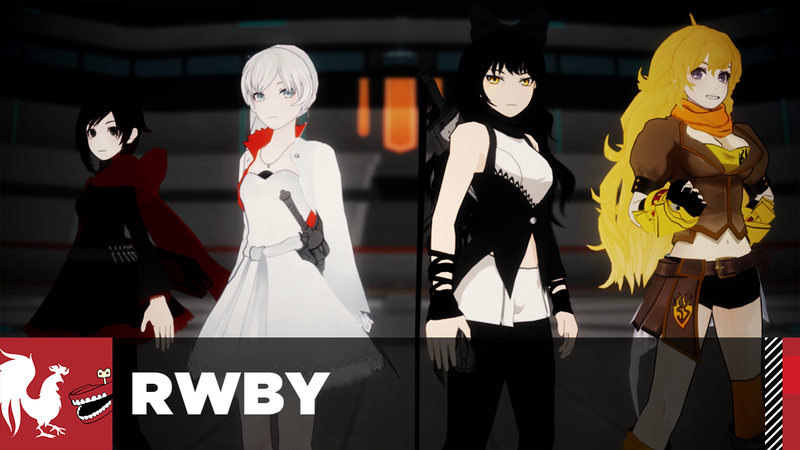 She joins her older sister Yang and together with Weiss and Blake, form Team RWBY (Ruby, Weiss, Blake, Yang). So many female characters! The entire main team is women and that’s unheard of, especially in a genre that deals heavily with ridiculous battle sequences and futuristic weapons–Ruby designed her own sniper-scythe. I’ve been describing this show to my friends as the fun of Teen Titans with the action of Dragon Ball Z. I know I’ll get flack for this, but it’s a better Harry Potter. Seriously. It’s a feel-good show, and while the episodes definitely take a darker turn in Seasons 3 and 4 (season 4 is currently in the being released via Rooster Teeth’s youtube channel, as well as on their website), you root for these female characters because they are loveable and energized in a way only cartoons can be. Women are fighters no questions asked. Monty Oum, the creator of the show, drops you into the world where women are just as capable as men to fight the creatures of Grimm. In this way, it’s a bit of a utopia–if only in that women are not banging their heads against the wall to be seen as equals. The show later provides world building background about women fighters, but even without that additional information, women fight and that’s part of the world. There is no toxic masculinity*. This is an action show, but no matter how the characters give and take hits , it’s good guys v. bad guys, not about conquering your opponent to prove you’re top dog. Also, the main male characters don’t talk down to, insult or sexually harass women. It’s great. Oh, and, occasional cross-dressing and it’s not played off strictly as a joke. So much queer fodder! Out of the main young characters, 6 out of 8 are female (Ruby, Weiss, Blake, Yang, Pyrrha, Nora). All 4 main heroes are female! So, Blake x Yang and Ruby x Weiss (though nothing confirmed yet). My main critique: we need more people of color. While the show highlights people of color in nearly every crowd scene, as well as featuring people of color in supporting roles, we need more heroes of color. Blake is potentially coded as a woman of color, but that is not enough. RWBY is not a paragon for diversity or intersectional feminism, but it brings fun back to fantasy. The world is dangerous and unfair, but there are heroes who will defend it nonetheless. You can watch the first two seasons of RWBY on Netflix, or seasons 1-4 on youtube. Prev Happy Birthday Hedy Lamarr!